Living Room (2 Swivel Rockers & Leather Sofa). This home is ready for the 2019 Summer Season! 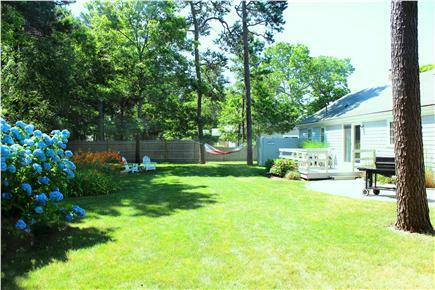 You will be challenged to find a Cape Cod vacation home this nice in this price range! 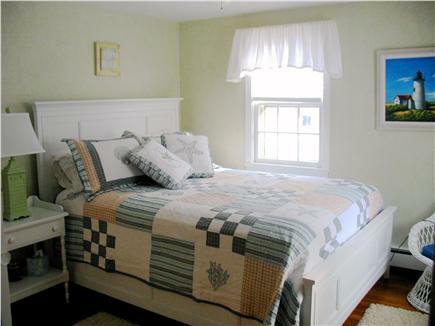 This bright, charming and tastefully decorated home is a perfect vacation getaway for a family of 4 or 5. The home offers privacy and is located in a quiet neighborhood, yet in close proximity to everything that makes Cape Cod wonderful. You are within a 6 mile proximity (5-10 minute drive) to more than a dozen of Cape Cod’s best oceanside and bayside beaches. 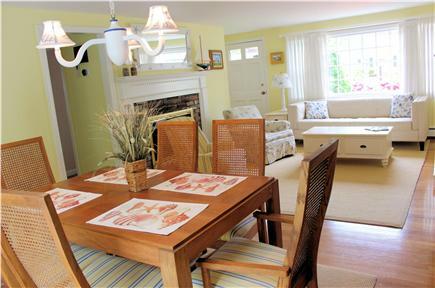 Tucked away within a quiet South Yarmouth neighborhood, this charming home offers privacy for the family seeking a little peace and quiet. It has a fenced backyard to provide added security for families with young children. 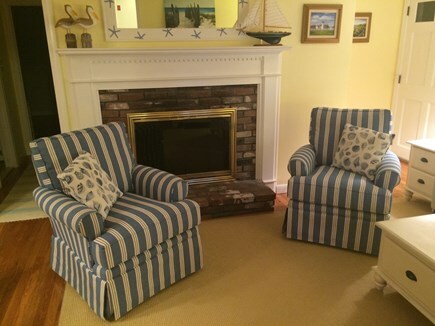 The home was tastefully decorated with an integrated seaside / vacation theme. The home also features a fantastic outdoor shower and high-end Weber gas grill for those who enjoy cooking out and eating on the patio. Hardwood floors throughout, two bedrooms, and quality furnishings throughout. 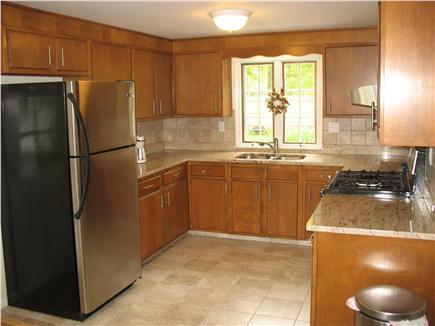 The kitchen offers stainless steel appliances and granite countertops. 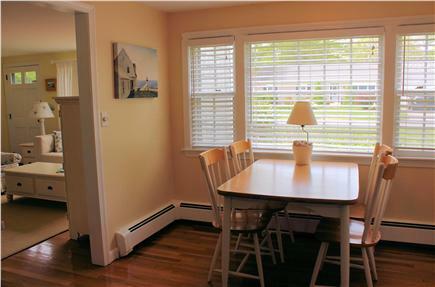 Air Conditioned throughout, so you never have to worry about being the family who books their vacation on the hottest week of the year (There always seems to be that one summer week on Cape Cod that is just a little too warm). Have you ever booked a summer vacation at a resort or property that looked perfect on-line, but disappointed the minute you arrive? What you see is what you get.....very pleasant, comfortable, quiet, charming, and clean accommodations. 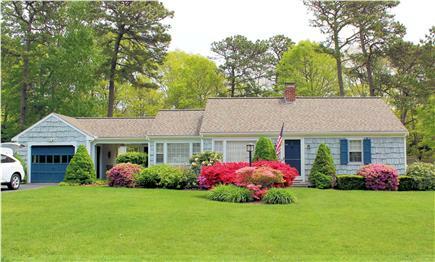 Located in a quiet neighborhood, yet close to everything great about the Cape! Access any of Yarmouth's or Dennis' bay-side or ocean-side beaches within minutes! 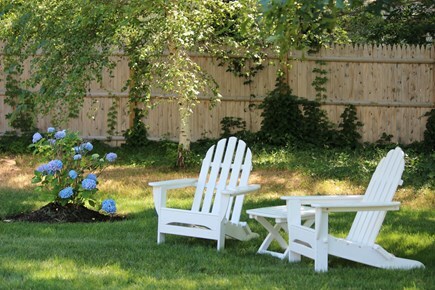 For those who enjoy biking, the home is a block from the famous Cape Cod Rail Trail (We provide all the bikes too). That is a must activity for anyone visiting Cape Cod. It has every popular attraction within minutes of the home, whether it’s Golf (< 1 mile); Cape Cod Rail Trail (< 1 mile) Popular Town Park with Playground, Basketball and Bocce courts (< 1 mile); Theater & Museums (< 5 mi); Cape Cod Yarmouth Red Sox Stadium (< 1 mile), Cape Cod Melody Tent (10 mi. ), Kids Funplex (5 mi. ); Water Park (5 mi), Downtown Hyannis and Harbor (10 mi. ); ferries to Nantucket and Martha's Vineyard Ferry (10 mi); and dozens of local Cape Cod restaurants and seafood establishments. We have bikes for your family to use during your stay, along with everything for your beach day (beach umbrella, cooler, chairs, toys). 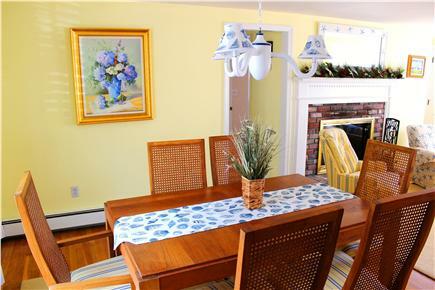 Interior Features: This home offers an open and bright floor plan with living accommodations of a nautical theme to enhance your families Cape Cod vacation experience. The first bedroom offers a queen bed,and the second bedroom has two full size beds. The home offers cable TV, w/ Apple TV w/ free Netflix movies for those rainy days, high-speed Internet with Wi-Fi. A Washer/Dryer too. Additional pricing info: $100 Cleaning Fee Added to Rental Fee, State and local taxes of 14.45% will apply. Everything provides single floor living (except for the washer and dryer, which is located in the basement). This was our second summer visiting this beautiful home. It is clean, comfortable and located in a quiet neighborhood. We enjoyed traveling to local beaches, eating at restaurants in the area, kayaking and using the grill in the backyard. The outdoor shower is wonderful after trips to the beach. My boyfriend also took advantage of golf and fishing in the area. My family of five from Sweden travelled New England this summer and spent a week in Cape Cod where we stayed in John's gorgeous home. The house is located in a quite neighbourhood perfect for families, with beaches, shopping and supermarkets close by. It is also located central on the Cape and it was easy to get around to all sights. I am so pleased that your family had a great time exploring everything Cape Cod has to offer! Glad we were able to provide accommodations that made you feel right at home, especially since home was nearly 4,000 miles away. Thank you for taking such good care of the vacation property during your stay. Thank you for taking the time to share your positive experience. It has been a pleasure hosting your family over the last two years, and we are thrilled that you will be returning again this summer. 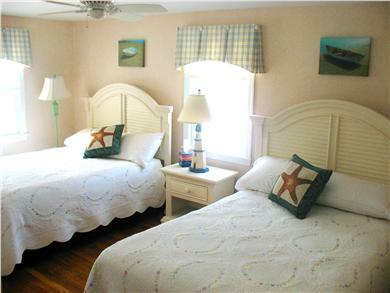 We take great pride at ensuring that the overall accommodations will make your family vacation to the Cape memorable, and it is always rewarding when the effort is recognized. Thank you. We have been renting this house for the last four years. We keep coming back because it is well situated on the Cape, easily accessible and in a quiet residential area. All services (grocery, beach, restaurants, shopping, sport activities) are all within a short distance. Best place we have stayed ... ever. Spent two weeks this past summer. Conveniently and centrally located on the Cape. Everything you need is close by (beaches, stores, Cape Cod baseball, and ice cream stores). Fenced in backyard provided a safe place for our children to play. House comfortably slept our family of 5 and provided the relaxation (hammock used often) and quiet that we desperately needed. Looking forward to seeing what is available in 2012. John has been renting his homes on Cape Cod since 2011. He takes great pride at ensuring all of his renters have perfect accommodations. He will do everything to ensure your stay is special and memorable. In his prior rental, 75% of the summer weeks were filled with returning renters. He knows how to deliver top-notch accommodations. Orleans is one of the nicest walkable towns on Cape Cod. It is a 10-15 minute walk into town from the property.